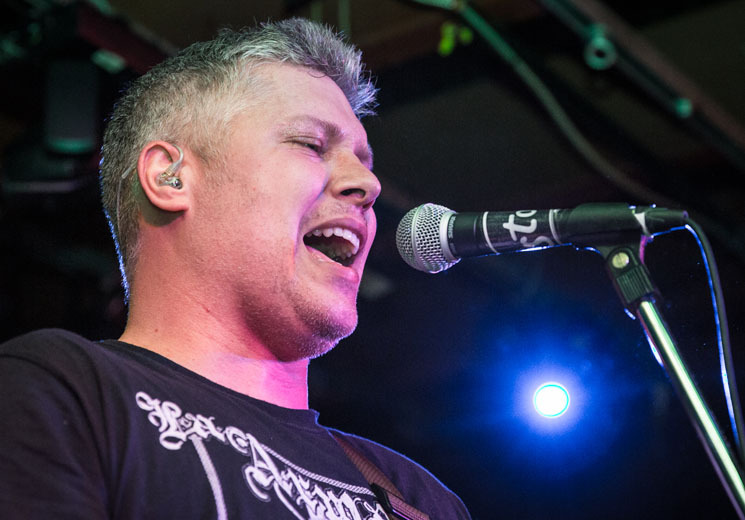 If you went to punk shows between the mid-'90s and early '00s in Calgary, you probably remember Belvedere and Downway, two local skate-punk groups that played their first show together in 15 years on Saturday night. Belvedere are the more impressive, and the one that always got more recognition. Canadians across the country might remember them from the days when George Stroumboulopoulos hosted The Punk Show on MuchMusic, which regularly featured their video for "Slaves to the Pavement" from 2004's Fast Forward Eats the Tape. The band obviously did play that song during their set, one of two that inspired some crowd-surfing amongst the aging crowd. The other was "Closed Doors," also off the same record, which is arguably their best effort and the last one released before they went on a brief hiatus. "Quicksand" is one of the album's catchier tracks and got a decent response along with "Early Retirement" too. Even if it's 14 years later and the guys are starting to look a little older, they still have the energy to keep up with the rapid-fire punk they wrote — lots of jumping and energy, as vocalist/guitarist Steve Rawles admitted that he regretted wearing jeans instead of shorts. The band plays can still pull off the technical, metallic and complicated instrumental solos common in most of their material. Sometimes the vocals were a bit muffled, but that can be common on some of their recordings too. Instead of doing a proper encore they just ploughed through with a blistering fast track called "Difference," from 2000's Angels Live in My Town. At the end, someone lit a sparkler and was promptly tossed by security, perhaps ultimately proving that even if you're entering your 40s and have grey hair, that doesn't mean you're any more mature. Downway were okay, but definitely not quite as tight musically and it's easy why those outside of Alberta aren't as acquainted with their songs. They also play super fast, but they don't have as much technical metal in their music and lots is more straight-up punk similar to what Lagwagon and No Use For a Name wrote. In between songs, they cracked some jokes about being old and it did seem like they were having a blast being onstage again. "Stop," from 2001's Defeat Songs, showcased what they do well and received a sing-along from the crowd. The quartet officially reformed last year and are working on a new album that they said will be out in the fall.